The question is, “What were they to hear?” Were they to hear a massive compilation of do’s and don’ts? Were they to enter the Promised Land with an attitude of debt and duty owed to this God who was giving the property to them? In a sense, yes, but so much more than just that. Through His Law, God defined Himself to Israel. His Law reveals His holiness. Try to define His holiness and you’ll understand. Some would say the word “Holy” means moral. But substitute that word in Isaiah’s prophecy (ch. 6) and the dilemma is apparent. Others would say it means “separate,” but once again… Whether we proclaim, “moral, moral, moral, or separate, separate, separate, Lord God Almighty, we are left with less than the text is acclaiming. The bottom line is we can’t understand God’s attributes fully, and definitely not His holiness. Therefore, His Law is meant to help us somewhat understand His nature; who He is. Why does He go to so great an extreme to reveal Himself? Because He is love (1 John 4:8, 16). If there’s any doubt of this, take a quick glance back to the cross. Brutally beaten and hanging on that tree is our God enduring the ultimate wrath of our God. Why? Because He is love. Because after revealing His holiness, righteousness, justness… His perfectness, the objects of His love rebelled. We rebelled. And even in our rebellion, He still is love, and therefore sent His Son into the world that through Him we might be saved. “Behold what manner of love the Father has bestowed on us, that we should be called children of God… (1 John 3:1). One rebel once tested Jesus with the question, “what’s the greatest commandment in the law?” In response, He quoted this verse from Deuteronomy 6:5. “You shall love…” Note the individuality of the command. While being given to Israel as a nation, it was as though Moses carried each individual into a private chamber and pointed his finger at them and said, “you.” “You” shall be in an active love relationship with Him who first loved you (1 John 4:19). As believers, we should be in it for Him… He’s in it for us. God didn’t come to die on a cross to enforce ten rules. He came for His people who He loves. Your God. Once again, a personal God. All your heart. A whole-hearted devotion to One. All your soul. (mind, will, emotion) Everything within one’s thinking capacity. All your strength. In every action and activity. Is it futile to think we can keep this greatest of commandments? Rather than give an answer, think back over the last twenty-four hours. Our perfection is found in none other than Jesus, and He does love the Father in full obedience to this command. But where Jesus lives, there should be a growing desire and love for God and His commandments. Why? Because we want the love relationship with Him just as He has established it with us. 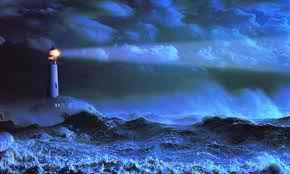 This entry was posted in Lighthouse Notes and tagged Christianity, command, faith, God, Jesus, Lighthouse, love. Bookmark the permalink. 3 Responses to Rules or Relationship? Love this post, as this is what it is all about. We are to love because He first loved. The world will know we are true Christians when we love like He did! Great post! He took care of the rules so we could have a relationship!